The following comes from the account of a British author, c. 1900. Mafalda and Francesca, it should be noted, are Italian children with imperfect English. It must be said that many funghi are poisonous and that no modern funghi hunter would collect ditole (pictured) in the reckless fashion that the three intrepid funghi hunters adopt here! Mushrooms, like manna, should be gathered afresh every morning, and on that October day the weather was ideal for the search. A week of soaking rain had been followed by hot sunshine, and the warm, damp earth was a perfect forcing-bed in which every fungus was hastening upwards at the top of its speed. Certainly such a morning must be devoted to a mushroom hunt: there was no need for Salvatore to tell us so; we knew it from our own experience as veteran hunters, without any advice from him; and, with nailed boots, baskets and clasp-knives, were off in the fresh of the morning, with a joyous sense of adventure, to seek these coy creatures of the wood. The dogs, who understand perfectly the pleasures which await them when country-boots and baskets are the order of the day, barked and bounded in an ecstasy of delight as we took the narrow track among the olives; then, having expressed their approval of the expedition, fell into a long, straggling procession down the road. Adolfo, the gardener, paused in his work of pruning roses to prophesy that we should return empty-handed; but Adolfo is a pessimist, so his prediction troubled us not a whit as we toiled up the steep slopes of the green and golden woods. It was a perfect morning. Birds sang softly among the white flowers of the myrtle thickets. Now and again a rabbit slid through the fern, rousing sudden excitement in the dogs. The scarlet and orange balls on the arbutus trees glowed in the sun like fairy fruit among their burnished leaves, and on the prickly juniper bushes the berries clustered, misty blue. A juniper is a pretty shrub, and its fruit useful for the making of gin; but I think Elijah must indeed have been hard put to it when, going a day’s journey into the wilderness, he sat down under the shadow of one to rest and pray that his life might be taken from him, though perhaps the juniper trees of Palestine are larger, more capable of shade-giving than the stunted bushes of Italian woods. The first mushroom was found by Francesca, and was a noble specimen of the ovolo tribe, orange-red above, primrose colour beneath; a class of fungus which takes its name from the manner of its growth, coming up through the soil in a cream-skinned egg, and after splitting this outer covering, opening in the sun like an orange parasol. But our search at first was, on the whole, unsuccessful, for the peasant boys had already been out since daybreak; and as little had escaped their sharp eyes the baskets remained distressingly light. Among the contadini, the mushrooms which they send their children to gather prove a profitable crop, as they sell them at the Villa or in the town, either for immediate eating, or to be preserved under oil as a pickle for winter use. Especially are they valued in the mountains, where the people have little to live upon save their chestnuts, and the strawberries, raspberries, and mushrooms with which the varying seasons fill the woods. Still we rambled on, confident that sooner or later some splendid discovery would reward our search. I wonder in what lies the fascination of a mushroom hunt! Certainly it is not the desire to eat mushrooms, for those can be set before me in every variety without my moving hand or foot; yet there is undoubtedly some charm which leads me day after day to clamber about the wooded slopes with eyes bent upon the turf and dead leaves and broom bushes; and even when I return emptyhanded I am always ready to set out again with fresh enthusiasm next day. It must be a spark of that adventurous spirit which once drove men forth in search of El Dorado; that passion which led the old explorers, sailing over unknown and mighty waters, or toiling through Alpine snows or desert sands, to go forward ever one league farther, feeling that realisation of hope and fulfilment of effort might lie at the end of that next mile. The feeling that any moment may reveal the longed-for treasure, the earnestly sought knowledge, has encouraged and led to all the world’s discoveries; and the desire to see round the next corner of life’s road, the expectation of something pleasant lurking there, is as strong in small things as in great. The excitement of the search, the eternal spring of hope, which made great enterprises possible, prompts me to walk on, my eyes fixed upon the ground, because I feel that the next foot of earth may prove a South Sea of discovery, that any moment may, after a whole barren hour, reveal a majestic ovolo, a sturdy porcine or, most glorious discovery of all, a crisp family of golden ditole. The Italians eat far more varieties of fungi than the English, and many which we despise as toadstools would on an Italian table hold an honoured place; but for an ardent searcher there is, in all the mushroom world, no greater joy than the discovery of ditole. 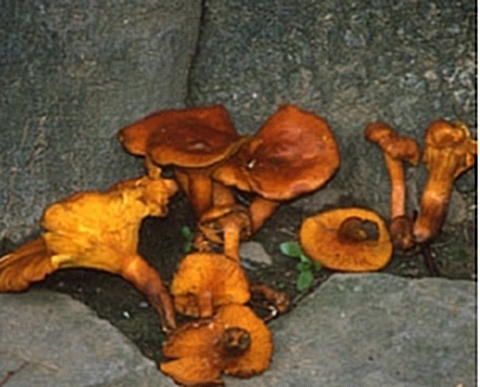 Its crisp form resembles a clump of golden coral as it pushes up under the moss, where some yellow gleam, some protruding sprig betrays its presence; and when the excited seeker turns back the green coverlet, a group may be discovered, so large as to half fill the basket, when carefully dug up with a knife. Ditole has another charm, in that it flourishes not only in families but in colonies, other clumps being almost invariably found in the neighbourhood of the first; porcine also have this domestic habit, growing in pairs, or, as Mafalda expresses it, a gentleman and lady side by side. As we climbed farther up the hill our patience was rewarded with more success; but, alas! while Francesca and I had both fairly well-filled baskets, Mafalda, for all her diligence in searching, had not found a single one. In vain had I offered her my best ones; her lofty spirit scorned such compromise. ‘I have not found them, I!’ was the form of her refusal; and I recognised the true spirit of the adventurer, and realised that it was not mere mushrooms which Mafalda wanted, but the proud moments when effort should be rewarded and hope be emptied in delight. ‘Never mind, dear,’ put in Francesca, offering a crude consolation. ‘Poverina, you are sure to find some soon!’ Pity in such a moment was, however, the one unbearable injury. Mafalda tossed her head. ‘It makes me nothing!’ she replied tartly: ‘these noiosi funghi, I want them not, I’ and she turned her back upon us in a lofty manner, toiling up the slope on fat bare legs whose lagging action betrayed the anguish of her soul. After this happy event we pursued our way in good spirits, although it was distressing to find many places where only the white roots remained of ditole clumps which had been nibbled off to the level of the ground. ‘It is those sheeps of Paradiso’, snapped Francesca vindictively, when she saw the traces. ‘I wish that they may die, every one!’ This would have been a somewhat extreme punishment, and I hinted as much to her; but Francesca is as stern on the subject of mushrooms as any English landowner over the preservation of game. We came upon some of these guilty animals a few minutes later, and upon the shepherd himself, a weatherbeaten man, staff in hand, who, with his dog at his feet and his back set against a tree-trunk, was gazing vacantly out across the Val d’Arno, and the undulating ripple of far blue hills. As I looked at him I feared that the shepherd’s vocation was wasted upon Paradiso; I doubted if he had any full perception of its joys. Yet it must be a good life, to dwell with all this beauty, and to have the long sunny hours in which to wander in the silence of the hillside, marking the time by the steps of the sun in heaven; and, from the going forth in the morning until the flocks are folded at night, hearing the music of birds and waters, watching the march of the seasons across the land, and feeding one’s soul upon the beauty of the world. I believe that I should be quite happy under such circumstances, in love as I am with the open air and sky, the grass and trees, and all the creatures of fur and feather which dwell in fields and woods. Of course I should have a dog; that is the right of every shepherd; and it would certainly be Plato, that big, grotesque, long-haired animal whom I love best of all the dogs on the place. When I need consolation, it is of Plato that I seek it, and find real comfort in feeling his large warm paw laid in my hand, and in meeting the grave kind gaze from beneath his shaggy fringe. I can never realise that Plato is a mere child, being little more than one year old; his long hair, his great, thoughtful, pathetic eyes with their earnest gaze suggest, like his name, some elderly sage or philosopher, and I have a sense of reliance upon him as upon some old and trusty friend. In spite of his strange appearance Plato must, I am sure, come of a noble family, for at times he assumes most stately attitudes, which contrast oddly with his rather clumsy build. When we are down in the ravine, crab-catching, he extends himself upon the rock above, the living presentment of the Lion of Lucerne; and whenever, out walking, he has a spare instant, he lies down, and gravely observes the landscape with thoughts which ‘do lie too deep for words’. I should like to discuss this pastoral question with Paradiso; to hear his opinion on the subject, and know whether, in his primitive soul, untouched by the breath of modern life, still lingers that profound, if dumb, love of nature, that poetry and ancient folklore in which his country is so rich; and if he is content to dwell alone with nature and be the friend of the creatures, or, not knowing how blessed he is, cherishes visions, never to be realised, of life as a music-hall artist or master of a city trattoria. Francesca, however, refused to linger while I satisfied myself on these points; she clearly held the shepherd responsible for the doings of his sheep, and in any case it was hopeless to look for mushrooms anywhere in the neighbourhood of the flock. The baskets were well filled at last, and the boom of the midday cannon, which reached us faintly from Florence, the bells ringing from the little hillside churches, warned us that it was time to be turning our steps towards the house. As we made our way through the heather, where the bees were humming as busily as if it were midsummer, we met an old man bent upon the same errand as ourselves, but with sadly different results. He was very old, very ragged; his clothes were patched with a score of colours, his long grey hair hung down below a battered felt hat; in his eyes was the dim, pathetic expression only seen in the eyes of the very old. He told us, in quavering tones, that he would be eighty-four next Ogni Santi; that he was past work, but that he came out to look for mushrooms, because his povera vecchia, his poor old wife, was ill, had no teeth, and needed soft food now. But he could see little, and the stooping made his back ache, and there seemed to be less mushrooms in these days than there were when he was a boy. Poor old fellow! He was a pitiful sight among the heather and the sunlight and the glad sounds and sights of the woods. He was feeble and worn-out, a burden on the sons at home, where there were many little mouths to fill. It was a pathetic age after a life of toil, and the sight of him made a shade in the sunshine as when some wayside Calvary throws its shadow across the sunny way. It was one of those sorrows for which there is no comfort, which make one’s heart ache with a universal pity for all the lonely, old, and sad. The great basket, large, perhaps, as the hope with which he had set out to look for food for his vecchia and the little ones, was almost empty; it stood under a tree with the bit of dry, dark bread for his dinner, while he wandered slowly about, a dreary, shrunken figure, his frequent ejaculations of ‘Oi! Oi!’ witnessing to the aching of the rheumatic limbs. I looked from the three full baskets to the empty one, then at the two children, and they understood at once. I was the first to empty out my mushrooms; Francesca, always quick to give, followed my example promptly; only Mafalda hesitated. She was very little, and the treasure to her was very great; she looked wistfully at her basket, then at me. I shook my head as I met the appeal in the blue eyes. ‘He will have enough now,’ I told her. But Mafalda, after the momentary reluctance, rose to the occasion nobly. ‘I give, also I!’ she responded with dignity; and, her basket emptied, we slipped away without a word. ‘Will he think Madonna sent them?’ asked Mafalda, as, hand in hand, we went down the heather-covered slope. Perhaps. Who knows? To his simple mind this may well seem food sent direct from Heaven. ‘Adolfo said we should come back with empty baskets’, remarked Francesca, swinging her stick as she walked; and I realised that, though she did not regret the mushrooms, it stung a little that Adolfo should be right. Yet what if he were? There are better things even in a mushroom hunt than full baskets, and if ours were empty, another’s and he more needy by far was full. It is not given to us every day to be agents in a miracle; and to the old man, I am sure, this sudden multiplication of his mushrooms could seem nothing less. So we reached the house in jubilant spirits, if emptyhanded, for what do mushrooms matter to those who have been fellow-workers of a miracle, and who have been privileged to set the little coloured shrine of some kindly deed by the dusty wayside of another’s road of life? On a fine September morning we started, Italian and English, men and women, masters and mistresses, and servants laden with innumerable baskets, big and little, each armed with a rough pair of scissors, and our padrona leading the way, with her guitar, pouring out as she went an endless flow of stornelli, rispetti, and canzoni, in which Tuscany is as rich as in any of the country products, maize or figs, pumpkins or tomatoes, oil or wine, or grain, the Italians amongst us improvising words to the well-known airs. The vintage is always a happy time; everyone works with a will, and is contented and light-hearted. As Modesto, one of our men, said, ‘Buon vino fa buon sangue’ (Good wine makes good blood). The old fattore (bailiff), who had retired from all active work on the estate, except the management of his especial pets, the vineyards alla francese (vines cut low in the French fashion, and not allowed to straggle from tree to tree as is the Tuscan usage), was very great on this occasion. He pointed out trees he had planted, and works he had done, fifty years ago, before the padrone was born. The dear old man was now seventy-eight, and as brisk and alert as any of us; with an eye still bright, and his keen, humorous face as full of vivacity as the youngest. He was full of old proverbs and wise sayings, like all peasants of the Casentino, his native region, about twenty miles south-west of Florence; and looked sharply after all our workmen to see that each duly did the picking of his row of vines. He was struck with great admiration at the way in which Englishmen, and women too, worked, and quite concerned for the repeated drenchings in perspiration of a strenuous old gentleman of the party, remarking gravely, ‘Questo povero Signor Antonio! ma suda troppo!’ (‘This poor Mr. Tom, he sweats too much’). He chuckled when we got hot and red under the burning sun, gracefully putting it to the ladies, ‘Il sole di Italia vi ha baciato’ (‘the sun of Italy has kissed you’). Twelve o’clock brought a welcome arrival – lunch from the villa. Grape-picking is a capital sharpener of the appetite. We were soon reclining – sub tegmine fagi – round a steaming dish of risotto con funghi, and a knightly sirloin of roast beef, which would have done honour to old England. A big fiasco (a large bottle bound round with reeds or straw, and holding three ordinary bottles) of last year’s red wine was soon emptied, well tempered, I should say, with water from the neighbouring well. At a little distance the labourers in the vineyard were enjoying the unwonted luxury of a big wooden bowl full of white beans crowned with polpette, little sausages of minced meat and rice. We first gathered all the white grapes. These were transferred from our small baskets to big ones, placed at the end of each row of vines. These bigger baskets were then carried on men’s backs to the villa, where the grapes were laid out to dry in one of the towers, on stoje, great trays made of canes. Here they are exposed to sun and air for some weeks, when they are used for making the vin’ santo. After the white grapes were gathered, we fell to on the black, of the choice kinds, the San Giovese, the Aleatico, the Colorino, and the Occhio di Pernice. These also were destined to be exposed on stoie in the same manner. They are used as governo, that is to say, when the new wine is racked for the first time these choice black grapes are put in, so as to cause another fermentation, they at once deepen the colour of the wine and make it clear. How melancholy the vines looked stripped of their grapes! The glorious white and golden, and pink and deep red bunches had given a beauty to the landscape which one did not realise until they were gone, and the poor vines stood bare. Of such tender sentiment and musical sound are the songs of the Tuscan ‘roughs’. These songs are most of them the composition, both words and airs, of the peasants and artisans who sing them. The hills round Pistoia and the streets of Florence ring with an ever-renewed outpour of such sweet and simple song. The padrone prides himself much on his fine breed of oxen, and told us the old Tuscan proverb, ‘Chi ha carro e buoi,fa bene i fatti suoi’ (‘Whoso has cart and oxen does good business’). When the last load of grapes was carted off we returned to the villa, where we found all hands busy in the great courtyard of the fattoria on one side of the villa, emptying the grapes and must out of the vats with wooden bigoncie, high wooden pails without handles. These are carried on men’s shoulders, and their contents poured into immense vats (tino) ranged all round the courtyard under covered arcades. In our wine-shed (tinaia) there are about fifty of these, containing from five to fifty butts each, besides three large square reservoirs of stone each holding three hundred barrels. The bubbling and boiling of the fermenting wine fills the air, and the smell is almost strong enough to get drunk upon. The men often do get tipsy, if they remain too long treading the grapes, or drawing off the new wine. But here it is an article of faith that the perfume of the must is the best medicine, and people bring weakly children to tread the grapes and remain in the tinaia to breathe the fume-laden air and eat of the fresh fruit; for at vintage-time no peasant or padrone refuses grapes to anyone who asks. They say that il buon Dio has given them plenty, and why should they in their turn not give to those who have nothing? I suppose this universal readiness to give is one reason why there is so little stealing here. You see vines full of fruit close to the roads, and quite unprotected by any sort of fence, and yet no one of the country-side ever takes them. There are, it is true, certain malfamati villages, whose inhabitants have the reputation of thieves, and against these, and pilferers from the large towns, the vineyards are guarded by men armed with guns, with which they keep popping the night through. At times you see twenty or thirty poor people standing quietly looking on, until called up to receive their dole of grapes, with which they go away happy, with their graceful ‘Dio ve ne renda merito’. At home they will mix water with the must they squeeze out of their basket or apronful of such ungrudged gifts, and make mezzo vino, or acquavello (water and wine fermented together), for the winter. The same thing is done on a large scale at many fattorie. This mixture of wine and water is distributed to the poor in winter, and is the common drink of the workmen about the villa. After the first good wine is drawn off from the vats, the vinaccia (skins, grape-stones, and stalks) is put into the press, and the second wine pressed out. This is good, but considerably rougher, from the larger amount of tannin, due to the skins and stalks, than that which is drawn off from the vats after fermentation without any agency of the press. After passing through the press, the clots of vinaccia are again put into the vats, and water is poured upon them. In eight or ten days a fresh fermentation takes place, and the vinaccia is once more pressed in the wine-press. This gives mezzo vino, or acquarello (half-wine), not at all bad, but of course of insufficient body to keep through the summer. For this there is no want of demand at the villa. Besides the rations of the workpeople, there are the poveri del buon Dio. In Tuscany there are no almshouses or poorhouses, save in the chief towns. Most villas have one or two days in the week when alms are distributed to all who come and ask. Here the gathering of poor occurs every Monday and Thursday, at ten in the morning. A hunch of bread, a glass of half-wine, and five centimes are doled out to every applicant, and on Christmas Day anyone who brings a fiasco has it filled with mezzo-vino, and gets half a loaf of bread and a half a pound of uncooked meat. Such has been the custom, I am told, for many hundred years. Our happy holiday vintaging lasted for five days, and then we went to help the vintaging of one of the contadini of the padrone, a family that had been on the estate for two hundred and eighty years. 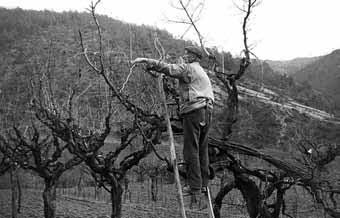 All their vines were trained Tuscan fashion on maples, and we had the help of ladders and steps to gather the grapes. Half the grapes, and indeed half of all the produce of the land – grain, pumpkins, flax, fruit, or wine – belongs to the padrone, who pays all the taxes and buys the cattle. The contadino pays no rent for his house, which the padrone keeps in repair. The peasant gives the labour, and the master finds the capital. This is, in rough outline, the system of mezzeria, or half-and-half tenure, still universal in Tuscany. Like all human things, it has two sides, and may be condemned as the most backward, or defended as the most patriarchal and wholesome of systems, binding landlord and tenant in the bond of an obviously common interest, and encouraging the closest and most familiar relations between the two. When the landlord is intelligent, active, and judicious, he may become a centre of enlightenment and improvement to his tenantry; but all his attempts must be made with the most cautious discretion, or he will infallibly frighten, and perhaps alienate, his tenantry, who are thorough Conservatives, and love stare super antiques vias. Thus the best commentary on the Georgics is still agriculture in action in Tuscany, a passing peep into one of whose most pleasing chapters has been attempted in this paper. Dario and his father-in-law, old Sorbi, were mending a wagon on the Aia, the former chanting lustily one of those untranslatable stornelli which are the growth of the Italian soil. Song is the habit of Tuscan peasants and servants, who sing alike at work and play for gladness of spirit; and Dario, especially, inherits this gift from his grandfather, who was one of the old minstrels who used to roam the country from fair to wedding, improvising rhymes and songs. Both he and Sorbi at once dropped their tools and hastened forward with brilliant smiles of welcome, and quite a pleasant bustle of excitement pervaded the little homestead as we arrived on the doorstep with half a dozen dogs. No courtier could have done the honours of his house more simply or more graciously than did these peasants. With frank and charming courtesy they offered us their best, both of accommodation and refreshment. Dario, hastening to and fro on bare brown feet, brought rushbottomed chairs from the house and ranged them under the loggia; then, responding to our tentative suggestion of fruit with a cheery ‘Eh, altro!’ seized a basket and disappeared into the podere, to return in a few minutes with the freshest of green and purple figs. ‘La Sorba’, an old woman whose wide straw hat framed a face like a ruddy, wrinkled apple, fetched glasses and a great straw-covered fiasco of wine; while the sposina, Dario’s wife, and daughter of the house, smiled shyly at us from the doorstep, where she sat with three black-eyed children clinging to her, and the last baby in her arms. It must be owned that both she and La Sorba were, like most peasant women on six days of the week, very slatternly, with old petticoats, loose, coloured bodices and uncombed hair, but none the less were they very picturesque. The quaint costumes of the contadini have, alas!, disappeared; but whatever the Tuscan peasant dons as a working dress seems to acquire a certain intangible charm. While the clothes they proudly put on for Sunday the loud stripes and plaids, the bright printed calicoes, the yellow boots are hideous, the weather-worn garments of every day, faded and mellowed by the weather, make patches of warm colour, purple, red and orange, among the olives and vines. The scene on that autumn morning was a quaint and pretty one, essentially Italian in all its details, as was the old farm with its thick walls of rough stone, and its loggia with rounded arches one of the characteristic features of a contadino’s house. A stone stair up the side of the house, opening at the top on to a balcony, led into the large dim kitchen, where a faint oil-lamp flickered before a picture of Our Lady. A small iron-barred window beyond gave a glimpse of far blue hills. There was a hooded stone fireplace, over which was fastened a bough of olive blessed at the church last Palm Sunday; a rough wooden table, an old cupboard, and a few stools. A bundle of hemp hung in one corner; from the beams were suspended strings of onions and bunches of dried herbs. Clean it was not, certainly, indeed, I doubt if the peasants ever wash their houses, and the stone walls and rafters were blackened by wood smoke; but it must be remembered that water, especially in summer, is scarce in Tuscany, so that cleanliness requires an effort greater perhaps than the people have any inclination to make. Outside, under the loggia, stood a scarlet ox-waggon, and some huge earthenware vessels, coloured an exquisite blue from having contained the sulphate of copper with which olives are syringed as a protection against blight a blue with which the peasants sometimes dye their old straw hats. Against the wall hung a sickle and other tools, and several flasks made from dried and emptied gourds. Beyond lay the Aia, a large yard irregularly paved with grey stone, where fowls were pecking; on the low, broad wall which surrounded it were spread trays of figs, split peaches, scarlet tomatoes and orange-tinted pumpkins, drying in the sun for winter use. In the thickness of the house-wall a little shrine had been hollowed to hold a figure of Madonna with the Gesulino in her arms, and before it stood a handful of wildflowers in a china cup. Beyond the Aia lay the podere, a serene world of grey and green; the olives varied in tint, now green, now silver, as the breeze swept over them; the vines burned bronze and crimson; and shutting in this peaceful nook were the pine-woods, and range after range of purple hills. 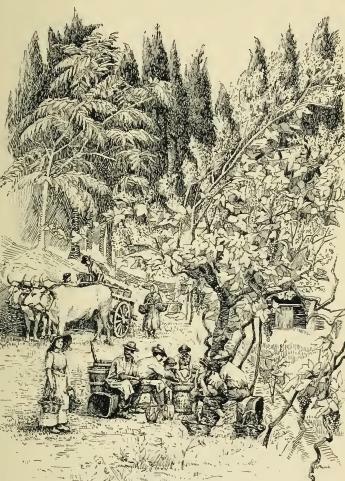 Certainly, seen on a sunny day in such surroundings, the peasant’s seems an enviable lot, spent in the pure air, in the midst of lovely scenery, his labour to till the soil from which he was taken and to which he must, by and by, return. Sunshine around him, songs on his lips, gaiety in his heart, these are the first impressions made by a Tuscan peasant. But in reality it is a hard life of incessant toil, alike for men and women. The contadino, from dawn to sunset, must dig and plant and sow and reap: his wife must nurse, cook, clean, feed the beasts, cut grass and fodder, help in the work of the fields. Even the children must work as soon as they are big enough to weed or pick out stones. The peasants live poorly, the most prosperous having three meals a day, but eating little save polenta made of maize flour; beans, mixed with salt and oil; bread, and occasional additions of vegetables, maccaroni and cheese. Few of them keep cows, and so have no milk, though a goat sometimes supplies a little for the children. They use oil for cooking; and butter is almost unknown to them, as even those who have cows do not make it, but sell the milk direct to the padrone or to some large dairy in the town. Old Sorbi, a short, sturdy man in a soft felt hat, stood by, entertaining us with his views on the weather, the crops, and the coming fair at the Impruneta; while Dario enlivened us from time to time with a burst of vivacious talk. No, in answer to Mafalda’s shy question, he had no sheep. There was no one to mind them: but the padrone had promised that when the bimbo there, with a jerk of his head towards his eldest grandchild, a round-eyed, barefooted boy of seven, should be big enough to mind them, he should have a flock. Meantime, he had oxen, and a pig, if the signorina wished to see the pig? The signorina did, and the creature dear to St. Anthony’s heart was accordingly ushered on to the Aia, grunting cheerfully, and eager to accept fig-skins and crusts of bread. Old Sorbi is the capoccia or head of his family, a dignity strictly observed in every contadino household. It is an office which usually, though not necessarily, descends from father to son, and gives the person who fills it full authority in all family affairs. It is he who manages everything, keeps the money, rules despotically younger brothers, sons, and daughters-in-law. It is he who represents the family legally to the padrone, and is responsible in all things for the land, utensils, and beasts. The other members of the household may offer advice, may join him in consultation, but it is emphatically he who acts. The head of the women, or house-mother, is called the massaia, and is usually an elderly person, who may be mother, wife, or sister of the capoccia. It is she who controls the feminine branch of the establishment subject always to the Capoccia’s approval; she who apportions work to the daughters and daughters-in-law, oversees the cooking, the sewing, the straw-plaiting, and all such woman’s work. Family affections are usually very strong among the peasants, as well as affection for the land on which they were born. They live together in patriarchal fashion; the old father, with possibly a younger brother or two, three or four stalwart sons, and their wives, who come to settle in their father-in-law’s house and share the work in-doors and out, mere farm servants without a servant’s wage. To these may be added a tribe of children; and yet, wonderful to relate, considering how trying such an arrangement must be to the temper, and what friction must at times ensue, they live, as a rule, in good-fellowship and peace. Occasionally, when a clan becomes too numerous to be accommodated by the house, or supported by the crops, a branch settles on another farm on the same estate, or, where that is impossible, as near the old home as they can. The ambition of a contadino is to have many sons to work the land, as otherwise labour must be hired, and where that cannot be afforded the peasant’s lot is indeed a hard one. When a contadino possesses, like Sorbi, one daughter, it is usual to marry her ‘in the house’; that is, to take her husband into her father’s house to help her father in the work, and some day to succeed himself to the proud position of capoccia and see his own sons grow up as heirs to the goodly acres and the old stone farm. Dario might well have good hopes of this happy consummation, being already the father of three chubby boys and a mimina; and he surveyed the little group on the doorstep proudly, as a man who had well fulfilled his mission, for where could old Sorbi have found a worthier son-in-law than he? Mafalda, having heard rumours of a new-born calf, grew restless with excitement, and a visit to the byre was accordingly suggested, where, by its creamy mother’s side, lay the tiny, wistful-eyed creature, a red string tied round its neck to keep off the evil eye, for the contadini, though they do not care to admit it, are full of superstitions, and cherish many an old legend about ghosts, witches, fays and elves. Woe to the unfortunate person who acquires the reputation for having the evil eye! He may be the gentlest of creatures, overflowing with the milk of human kindness, and blameless of any ill-will towards his neighbours or their goods. To have been present two or three times when misfortunes have occurred; to have, in a careless moment, suggested the possibility of some evil happening which afterwards came to pass, these things are quite enough to start the rumour which will grow faster than Jack’s magic beanstalk, and, wherever he passes, ‘horns’ will be surreptitiously made to ward off the mischief which his presence would otherwise bring. Old Sorbi gazed proudly at the calf and its mother, and with even more affection at the pair of great white oxen in the neighbouring stall; one of whom, lying on his bed of dry fern, rose indolently at the sound of his master’s voice, first kneeling, and then straightening his hind legs with deliberation, until at last he stood erect. The contadini have usually a passion for their oxen, treat them with the utmost kindness, and talk to them as if they were human, for, as Sorbi told us, with a sounding slap by way of caress on the shoulder of the nearest, ‘It is they, signorina, who earn the bread’. ‘Chi ha carro e buoi, fa bene i fatti suoi’; and Dario nodded approvingly as, with a handful of straw, he occupied the shining moment in grooming their glossy sides. Dario is a tall, able-bodied fellow, but his head was much below the level of the oxen, who looked, as the peasants say, like mountains, so enormous was their height and bulk. The last words of old Bacchiche, one of the contadini, to the sorrowing sons gathered round his bed when he was cut off untimely by pneumonia at the age of seventy-seven, were, ‘Ragazzi, rispettate sempre il bestiame e i padroni’, words entirely typical of the attitude to life of a peasant of the old school. The sons to whom this exhortation was addressed, grown men of forty or fifty, had been in subjection to their father all their lives as completely as children. In obedience to him they had trudged week by week to a distant and lonely church, because he believed that the village church, which stood several miles nearer, was a place of temptation; since a village meant a wine-shop, and evil companions who might tempt these blameless youths from the paths of sobriety and virtue. In vain their comrades twitted them with their submission ; they had been trained to respect their father’s will implicitly, even in the matter of the wives he chose for them, and were so well accustomed to order themselves lowly and reverently to all their betters, first of whom stood the padrone, that there was hardly need of their father’s dying words. On our return to the Aia, La Sorba peasant women being generally referred to with the utmost simplicity by the feminine form of their husband’s name invited me, in response to some comment on the size of the house, to visit the upper storey and see for myself what a Tuscan farm was like. Mounting the flight of stone stairs, we passed from the kitchen through several rooms, all comfortless and bare. The old people’s room contained only a bed, a chair, and a chest on which stood, under a glass case, a plaster Bambino Gesu; the next was as scantily furnished; in the remaining rooms were tools and piles of grain. I asked La Sorba if she had any of the jewellery which the contadini used to hand down from one generation to another; for the Sorbi, being a prosperous family, were likely to own such things. ‘Eh, altro!’ she responded, with a proud nod of the head, ‘the signorina shall see’; and leading the way to the chest of drawers, she drew out a necklace and earrings of garnets and pearls, a string of corals, and two silver daggers for the hair. They were typical peasant ornaments of the ancient days, quaint and charming, of no little value, and I should have liked to possess them for myself! ‘There was Pietro, my brother’, she told me as she laid them back in the boxes; ‘he took a wife of a rich family, her father was a fattore, and she had more things in her dote than I. But when she died, and the child, Pietro sold them. For, said he, who is to wear them now? A pity, was it not, signorina? And the dealers gave him very little, though they say the signori in the city pay dear to have such things.’ They do indeed, and the dealers must make good bargains, buying as they do from the contadini, who generally only under stress of debt or illness part with these family heirlooms, and selling to the rich English and American travellers in search of curios. At last the height of the sun in heaven warned me, even without an appeal to Dario, that it was close upon midday, so, calling the children, who were examining the baby with interest, we said our farewells, with much exchange of complimenti, good wishes, and promises of a speedy return. The rural feast had been a charming little episode, a pleasure to those who received, a pride to those who gave; and as, at the turn of the cart-track into the woods, I looked back at the farmhouse, I saw the whole family still grouped on the Aia, to watch us and smile a last good-bye. Ah, the dear Tuscan peasants, how I love them! There may be much to criticise in them, but there always is in children; and what are they, after all, but children of a larger growth? Of course they are very ignorant, very pig-headed. They will keep a child sick of diphtheria shut in a close room where no fresh air may penetrate, refusing to let it go to the hospital, because they have heard that in hospitals the windows are opened and the children die of cold. When the poor mite dies of suffocation, they do not think it owing to negligence on their part. No, the buon Dio wanted the Angiolino and has taken him, and blessed be all the saints that he died in his own bed with his own family at home! Dirty they are, certainly, and superstitious; very passionate; subject to swift rages and violent jealousies; rough and untaught: yet, in spite of all these defects, I love them; partly, perhaps, because they are the survival of an order of things which in our own country, with its progress and higher education, is passing fast away. They live their simple lives, their daily round of rhythmic toil, between three points the home, the Church, the Campo Santo. Born on the soil, they are contented to live by the soil, seldom desiring to strike out a new line as servant or artisan. Their primitive souls are free from all touch of modernity; they cling to their ancient traditions and customs, and to the old home among the olives, where often generations of a family are born and die. They find joy in their simple work; they love the ground they cultivate; the only excitements which break the monotony of their lives are the weekly messa, a vintage or marriage dance, or a country fair. They are usually, at least when young, sunny-tempered, debonair, vivacious, pleased with little, gay on almost nothing. They are warm-hearted, and, to their padroni at all events, manifest a charming cordiality of manner, a rough but sincere courtesy which prompts them to offer their best. They are generally very poor, though the term is, after all, relative, and to a Calabrian or Sicilian peasant the possessions of a Tuscan would be wealth, but, if poor, they are seldom discontented. They are industrious, and, as a rule, sober; drunkenness for which the Tuscan euphemism is ‘raising the elbow’! being not a common vice. They are both proud and respectful, perhaps respectful to others because proud themselves. They are unstudied in manner, graceful in gesture and attitude, as may be seen by a glance at any Tuscan taking his siesta in the shade. They always retain a touch of natural dignity well becoming those whose ancestry runs back to old Etruscan races, and who have the blood of Caesar’s armies in their veins. They are devout in their primitive way, desire the blessing of the Church on their crops and cattle, and cherish a profound belief in the protection of Mary V irgin and the saints. Ah yes, with all their faults which I do not deny they are lovable. They charm by their very simplicity and spontaneousness in an age so little simple as our own. And, for all their failings, is there not ever in their ready smiles something of their southern sunshine? are they not the true sons of that dear soil which once mothered all Europe, and of which, for many of us, are born the loveliest and most precious of our dreams? This short monograph, unfortunately published only in Italian, discusses the the plight of the small farmer in the Italian region of Umbria during Fascism (1921-1943). The title, Agricoltura e condizione contadina in Umbria durante il fascismo (Agriculture and the Condition of the Farmer in Umbria during Fascism), belies an attention to more than simply the state of agriculture. Ventura explores how fascism sought to reverse the gains of the so-called Red Biennio of 1919-1920. Absentee landlords of large tracts of Umbrian land were among the most fervent supporters of the Fascist regime, which turned back the clock on the reforms in sharecropping contracts won during that period. The "vite maritata," a grapevine trained up an elm tree, example of the so-called "coltura promiscua" (mixed farming). Here follow some Tuscan contadino proverbs from a nineteenth-century collection. All relate to food. 14. Quel che non ammazza, ingrassa: what doesn’t kill you will make you fat. 18. Zucchero non guastò mai vivanda: sugar never ruins any food. 19. A peasant only eats a chicken when he or the chicken are ill.
Of land-leasing in the English sense there is little: on almost every estate is established the system of mezzadria, a division of labour and capital which arouses in the contadini, as part-proprietor, a genuine interest in crops and cattle. Every estate worked upon the mezzadria plan is divided into various farms or poderes, varying in extent from seven or eight to thirty acres, or even more. Upon each podere stands a house, stables, and outbuildings, all provided by the padrone, and for the use of these and the land the contadino gives his work, so that a farm is often handed down from father to son, from one generation to another, and the peasant learns to love the land he cultivates as something of his own. This system of half-and-half tenure was instituted, writes one of its Italian supporters, ‘in the palmy days of the Roman Republic, when the plebeians obtained civil rights, but fell into disuse when slavery became general’. It was re-established in the fourteenth century, and perhaps the peasants’ custom of speaking of themselves as their padrone’s gente (Latin, gens) is a survival of the Roman origin. It is a system which has many advantages. The people, if poor, have at least a roof to cover them, a piece of land to till. They learn to love the soil they cultivate with something of the old pagan passion for the earth, which is, after all, natural to all men, since we, too, are of the clay from which the Potter shapeth the world. The bitter, grudging feeling, often aroused in a day-labourer towards his master, is unfelt, for the contadino and padrone share both gains and losses, and the former in desiring his master’s prosperity is also desiring his own. The padrone, in addition to land and house, provides such oxen, horses and donkeys as are necessary, presses for oil and wine making, and tools, carts, and other stock; but if an ox or other beast dies, the loss is shared. The contadino, on his side, pays, instead of rent, one half in kind of every crop corn, grapes and olives; and in money, one half of any profit made by the sale of animals, vegetables, eggs and milk. A bailiff, known as the fattore keeps all accounts, and once a year a professional accountant goes over the books and reads out to each man in the padrone’s presence all the items to his own credit or his master’s during the year, so that either can correct any mistake. Of course this system, like all others, is capable of abuse, especially when an absentee landlord leaves all in the hands of his facttore, who in such cases, by skilful adjustment of the books, makes his profit from master and peasant alike. ‘Fammi Fattore un anno E se non mi aricco, mi danno’, is a saying supposed to express the usual way of bailiffs, but where the fattore is an honest man there can be little doubt that the system works well.